Today was one of the first days this summer that I’ve shut off the air and opened the windows. So what did I decide to do? Turn the oven on and bake!!! Brown Eyed Baker made a Blueberry Crumb Bars that I got today and they looked so good. I had some mixed berries in my freezer and decided to see how it would turn out with a variety of fruit! I almost doubled the recipe and when I when I went to see what more I had in the freezer, I found a full bag of blueberries! So I mixed them in with the raspberries and strawberries. Last night I did some of my grocery shopping and usually grab a bag of lemons to add to my water but this time decided on using limes. So we’ll see how that turns out with the berries! I’m not usually one to add or change much when baking because of my comfort zone, but it’s what I had so I went with it. I don’t know if I’ll ever have a “comfort zone” when it comes to baking but we’ll see! When I first turned on my oven, I could smell pizza crumbs that must have fallen earlier this week!!! Now my house has this fabulous smell!! Of baked berries!! I love getting recipes every day from Michelle. She makes some pretty amazing desserts/meals. I’m just happy when I can bake something and it turns out to be pretty good! Preheat oven to 375 degrees F. Lightly grease a 9×13-inch baking pan. Make the Crumb: In a medium bowl, whisk together the flour, sugar, baking powder and salt. Use a fork or pastry cutter to blend in the butter, and then the egg (the dough will be crumbly). Press half of dough into the prepared pan. In a separate large bowl, whisk together the sugar, cornstarch and lime juice. Gently fold in the blueberries to coat evenly with the sugar mixture. Spread the blueberry mixture evenly over the crust, drizzling any excess juice in the bowl over the filling. Crumble the remaining dough evenly over the berry layer. Bake for 45 to 50 minutes, or until the top is light golden brown. Cool completely before cutting into squares. Leftovers can be stored in an airtight container or wrapped in plastic wrap at room temperature or in the refrigerator. Last week I made Brown Eyed Bakers Snickers Rice Krispies Bars and they were soooo good. I had gone out of town a couple of days after making these and I hoped that there would be at least one bar left for me (yay there was)!! Then I saw these Oreo Cheesecake Bars on Michelle’s site and I so had to try these too! My family likes (okay I like) the yellow Oreo cookies more than the chocolate ones, so I thought I’d change it up a bit and use those instead! I’m thinking I should have doubled the recipe so that I would have enough of these to feed all of the sweet tooth eaters in the house. Once I tend to get my picture down for the blog, these types of treats seem to disappear. 1. Preheat oven to 325 degrees F. Line an 8×8-inch square baking pan with foil or parchment paper, allowing it to hang over two of the sides. 2. Make the Crust: Process the Oreo cookies in a food processor until they are turned into fine crumbs. Drizzle the melted butter over top and pulse a handful of times until the butter is evenly distributed and all of the crumbs are moist. Dump the crumbs into the prepared baking dish and press into an even layer. Bake for 10 minutes (leave the oven on). 3. Make the Cheesecake: Beat the cream cheese on medium-high speed until smooth, about 2 minutes. Gradually add the sugar and beat until incorporated. 4. Slowly add the eggs, beating well after each addition, and mix until completely combined. Scrape down the sides of the bowl and add the sour cream and vanilla, beating until incorporated. 5. Gently fold in the chopped Oreos, then pour the batter over the prepared crust, smoothing it into an even layer. Bake until the edges are set but the middle still jiggles slightly, about 40 to 50 minutes. 6. Place the pan on a cooling rack and let cool to room temperature, about 2 hours, then cover the pan with plastic wrap and place in the refrigerator for at least 3 hours (or up to 24 hours) before serving. I’m so thankful that there are so many great bloggers out there to share their fun with us! Not only do I learn from them but I get to share their great recipes. Oh how sweet are these cookies that I found on Brown Eyed Bakers site! I was nervous, as always with adding the frosting to the cookies, but I was ready to give it another try! Brooklyn has been telling me lately that she wants to spend more time with me. Since we both love to cook we decided to put our best effort forth in making these cookies. Hoping that we can, first make them taste good and second come close to looking as good as Brown Eyed Baker does. Thanks to her my grand daughter and I got to spend some awesome quality time baking awesome cookie! Apparently I didn’t buy enough chocolate sprinkles so we used some pretty colorful ones too!! I sure take my hat off because I’m not sure I could begin to know how to come up with a cookie ingredient just by taste. Dinner? Sure, but for cookies or desserts, I turn to these awesome blogs for my help. 1. Preheat oven to 350 degrees F. Line two baking sheets with parchment paper. In a medium bowl, whisk together the flour and salt; set aside. Pour the chocolate sprinkles into a small bowl; set aside. 2. Using an electric mixer on medium-high speed, cream together the butter, powdered sugar and vanilla extract until light and fluffy, about 3 minutes. Reduce the mixer speed to low and add the flour mixture. Once it is mostly incorporated, slowly increase the speed back to medium-high and beat for another minute or so until a dough forms. 3. Scoop out a tablespoon of dough, roll it into a ball, and then roll it in the chocolate sprinkles and place it on the baking sheet. Repeat with the remaining dough, spacing your cookies about 1½ inches apart on the baking sheet. Make a slight indentation with your thumb (or the back of a melon baller – my favorite tool for this task) on the tops of all the cookies. Bake for 10 minutes, then make a deeper indentation in the middle, and bake for an additional 8 minutes. The cookies should not brown much at all around the edges. Transfer the cookies to a wire rack to cool completely. 4. Meanwhile, make the chocolate icing for the filling. Beat the butter with an electric mixer on medium-high speed for 2 to 3 minutes, or until light and creamy. Reduce speed to low, add the powdered sugar and cocoa powder and mix until combined, then increase the speed to medium and beat until smooth. Add the milk and the vanilla extract and beat until light and fluffy. Add more powdered sugar or milk to achieve the desired consistency. 5. Once the cookies are cool, pipe some frosting into the middle of each cookie (or you can spoon it in). Store leftovers in an airtight container at room temperature for up to 5 days. I was so pleased with the taste of the cookie. Way to go Michelle. She did what she was trying to do in my opinion!!! These taste awesome. Reading her post, she says she’s trying to get as close to the bakery that makes these cookies. I have no idea what they taste like, but what she has here, is pretty dang good to me (and my family who keeps asking if they can have more!). You’ve got to try these for sure. The flavor of the cookie…I can’t come up with how it tastes, but it’s a very good thing!! Here’s another post I found on one of my favorite blogs from The Brown Eyed Baker…Peanut Butter Cups. I had actually planned on making these for Christmas last year but…well I’m not sure what happened. I’m just now getting around to making them and I am so glad that I did. Just like everyone has a favorite color, most people also have a favorite candy bar. I can say that I rotate my favorite depending on what kind of mood I’m in for that week. One week it’ll be Peanut M&Ms and the next week it’ll be Twix or Heath candy bars. But one of my all time favorites is the Reese’s Peanut Butter Cups. When the kids go trick or treating for Halloween, they know to take those out of their bucket and either hide them from me or just give them over right away. So when I saw her post for this, I knew at some point I was going to have to try them. There are certain things that you just can’t eat one of no matter how hard you try. For me, these were it. I made them later in the evening last night and again, the hardest part is the waiting you have to go through when it has to harden in the fridge. My fingers poke in there numerous times to see if they are done. Then a minute goes by and I have to at least see if it’s done. Of course it’s not. Ten minutes does not by any means come close to 30 minutes it’s supposed to sit in the dang fridge!!! And when that time finally did pass, I had to have a least four of them to make sure that they were good. Duh. How else was I supposed to share if I wasn’t absolutely sure they were good to go!!!! 1. Line a mini-muffin tin with paper liners; set aside. Line a baking with parchment paper; set aside. 2. In a medium saucepan, combine the peanut butter, butter and brown sugar over medium heat. Heat until completely melted and starting to bubble a little, stirring constantly. Remove from the heat. Add the powdered sugar a ¼ cup at a time, stirring until completely combined with the peanut butter mixture after each addition. Set aside and let cool. 3. Meanwhile, melt the chocolate chips and shortening together in the microwave on 50% power in 30-second increments, until completely melted, stirring after each burst. 4. Using a small cookie scoop or a couple of teaspoons, spoon melted chocolate into the bottom of each lined muffin cup. 5. Use a heaping teaspoon to scoop out the peanut butter mixture. Roll it into a ball, and then flatten it slightly into a disk. Place on the prepared baking sheet lined with parchment paper. Once finished with all of the peanut butter mixture, refrigerate both the muffin tins and the peanut butter patties for about 30 minutes. 7. Refrigerate again for 30 minutes, then they’re ready to serve! Store in the refrigerator or freezer. You can keep at room temperature in an airtight container if you’re going to serve them the same day, but they’ll start to get soft if not at cool room temperature. The only thing I did have to do was add a bit more powdered sugar to the peanut butter mixture to get it thick enough to roll into a small ball. Other than that, these little bundles of heaven in my mouth are to simply die for. Anyone that loves Reese’s Peanut Butter Cups, HAS to try these. I had some extra peanut butter mixture left over so I used a small bag of white chocolate chips and made more! Love, love, love these! Thank you, thank you for sharing these..
I’m sure that the Brown Eyed Baker is getting tired of me making some of her desserts! Or hopefully she’s taking it as compliment that I love what she bakes and want to try..try..try! I have to give myself credit for attempting these. This is my other gal pals area of expertise, not mine. It actually makes me feel uncomfortable going in the kitchen and baking. I’m not sure why. I made those scallops yesterday with the avocado sauce with the scallops without one worry if it would turn out or not. I just don’t have the confidence quite yet when it comes to baking. Not sure if I’ll ever get there, but I will keep trying. So here’s a picture of my attempt at baking these cupcakes. I will say that they taste better than they look! I will admit that I should take a photography class to get familiar with my new camera. But along with that I think that I need to practice getting the piping of the frosting down a LOT better! But I’ve always said that I would post my good and bad attempts. I’m putting this in between. They taste pretty good. They just don’t get the star on the looks! 1. Make the Cupcakes: Preheat the oven to 350 degrees F and line a standard muffin pan with paper liners; set aside. 2. Sift together flour, cocoa powder, baking soda, and salt in a small bowl and set aside. 4. Beginning with the flour mixture, add in 4 parts to the butter mixture, alternating with the Coke mixture. Beat each addition just until incorporated. Give the final mixture a good mix with a rubber spatula to make sure it is thoroughly combined. 5. Divide the batter evenly between the muffins tins. Bake for 18-20 minutes, or until the tops spring back when touched lightly and a toothpick inserted in the center cupcake comes out clean. Cool for 5 minutes in the pan and then transfer to a wire rack to cool completely. 6. 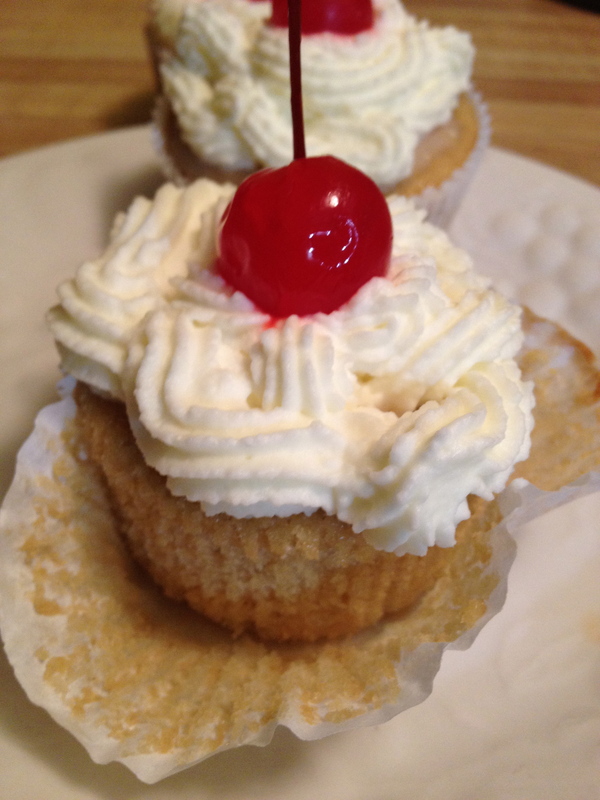 Fill the Cupcakes: Once cooled, use a paring knife to cut out a cone shape in the middle of each cupcake. Add a spoonful of cherry mixture (2 to 3 cherries) to the well. 7. Glaze the Cupcakes: In a small bowl whisk together the powdered sugar and coke. Let sit 5 to 10 minutes to thicken. It should drip off of a soon very slowly. Using a small offset spatula, drizzle a little of the glaze onto the middle of each cupcake and then gently spread it over the top. 8. Frost the Cupcakes: Beat the heavy whipping cream in a chilled bowl with whisk attachment (or hand mixer), beginning on low speed. Once the cream gets frothy begin adding the powdered sugar, 1 tablespoon at a time, increasing speed as the cream comes together until you reach medium-high speed. Whip the cream until it holds stiff peaks (if you dip a spoon in it, the whipped cream should stay on the spoon when you turn it upside down). 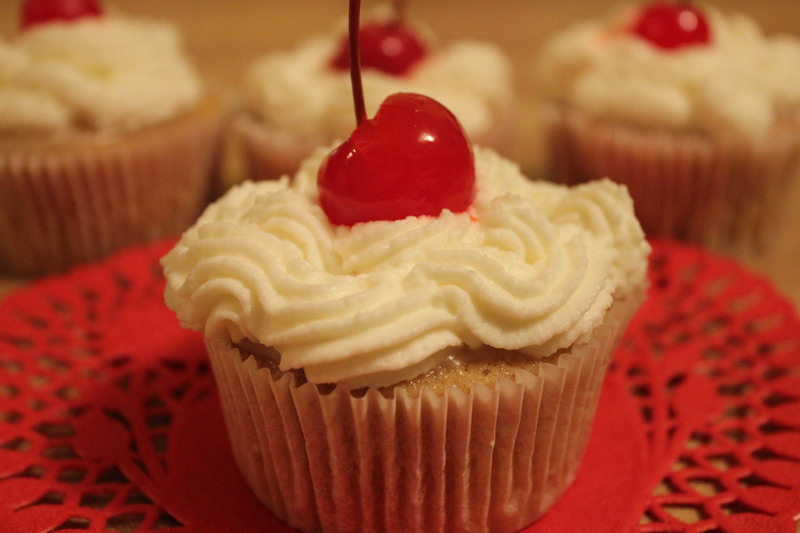 Pipe the whipped cream onto cupcakes as desired and top with maraschino cherries for garnish. I showed my sister and my niece the original picture from The Brown Eyed Bakers site and they both wanted to try them. Brooklyn spent the night at her house on Saturday so she dropped her off in hopes of getting to try these! My nephew came with her to try them as well. Which is the only reason he came with her! He said they tasted awesome but my frosting job was not so good! Way to make me feel good there nephew! I will continue to work on the piping and come back with better photos with the new camera! These are incredibly good. There were 3 out of the 12 left after I finished frosting. If you’re a cake love, these are a must try! I’ve mentioned before that Brown Eyed Baker is one of my favorite blogging sites I go to almost every day. She never fails to give a great dessert! When I saw these on Pinterest I knew I had to make them. I didn’t care if I failed, if my picture was less than perfect…I just new I had to try these. And let me tell you, these are so good. These are really good. If I had all of the ingredients on hand right now, I’d make them again. I don’t care if they have sugar in it that I’m not supposed to have, I loved these. Did I say that again!! These were a huge hit in our house. They were gone within two days if not sooner. When you compare my picture to Michelle’s, you’ll see that her cookie dough is much lighter than mine. I’m not sure what I did differently. It could be the lack of photo skills that I have (my goal is to get a better camera this year). But does it really matter when you make something that you really, really like? The answer would be NO! 1. Prepare the Brownies: Preheat oven to 325 degrees F. Line a 9×13-inch pan with foil, with enough to hang over all four sides. Butter the foil. In a medium glass bowl, melt the chocolate in the microwave in 30-second increments, stirring after each, until melted and smooth. Set aside to cool slightly. In a large mixing bowl, mix the butter and brown sugar with an electric mixer on medium speed until light and fluffy. Beat in the eggs and vanilla extract, scraping the bowl as needed. Mix in the melted chocolate until combined. Reduce the speed to low, add the flour and mix just until combined (don’t over-mix). Spread the batter into the prepared pan. Bake 25 to 35 minutes, or until a toothpick inserted into the center comes out clean. Let cool completely. 2. Prepare the Cookie Dough: In a medium bowl, use an electric mixer on medium speed to combine the butter and both sugars. Add the milk and vanilla and mix until combined. Reduce the speed to low and mix in the flour just until combined. Using a rubber spatula, stir in the chocolate chips. 3. Spread the cookie dough over the cooled brownies. Refrigerate until the dough is firm, about an hour. Use a sharp knife or a pizza cutter (my favorite way to slice brownies!) to cut the brownies. Store the brownies in an airtight container at cool room temperature or in the refrigerator. I will be making these again. I will not be using the “all things in moderation” sentence in my head for these! I have said this time and time again. I cannot bake. I don’t enjoy it (though I’m really trying – I am), I typically have to start over at least, at least once. And this time is no different than any other. But it’s Christmas time and Santa needs cookies to eat right? Oh and there’s this other little matter called a cookie exchange that I’ve been invited to. Caleb played football and now basketball on Saturdays. You get to know the parents. Well there is a boy that was on his football and now basketball team. I sit by his mom every Saturday. Two Saturday’s ago she told me about this cookie exchange that she’d like to invite me to. I sit and wonder if I had this terrified look on my face because that’s exactly how I felt. Me? To a cookie exchange? The first thing I did was text my other Two Girl, Jodi and told her I’d pay her to bake me 5 dozen cookies. She gladly agreed if I would watch her new little bundle of joy. And though that thought sounds much better than me in the kitchen baking, I decided to give this a try. For some odd reason I thought that I needed to bring a dozen of 5 different kinds of cookies. So today I gave it some thought and started to put a list together. I went to my favorite baking site www.browneyedbaker.com and started searching. It’s not hard to find something on her site. She does this well. She can bake. Her pictures are amazing. I even wonder to myself who the heck eats all of this sugary food that she bakes almost daily. On her site I found these four recipes: Chocolate Chip Cookie Dough Brownies, Toffee Pretzel Bark, Peppermint Bark and Home made Peanut Butter Cups. The fifth recipe I got from a friend from work on the Betty Crocker site. They are called Caramel Fudge Turtle Cookies. When searching on the site I found the Dark Chocolate Apricot Cookies. Since the family prefers white chocolate, I’m going to give this one a try for now. If it works, then I’ll try the Turtle ones as well. Hey, if I’m baking, I may as well go all out!! In the mean time, I send an email to Mary asking her about the cookie exchange (since this is my first time – and hopefully not the last time) needing more information. She got back to me and told me that I need to make one type of a cookie and 4 1/2 dozen on eight different plates. Still, I’m in a panic. What if I can’t do this? What if these other ladies have these fancy cookies decorated beautifully while mine are either made by Jodi or store bought!!! 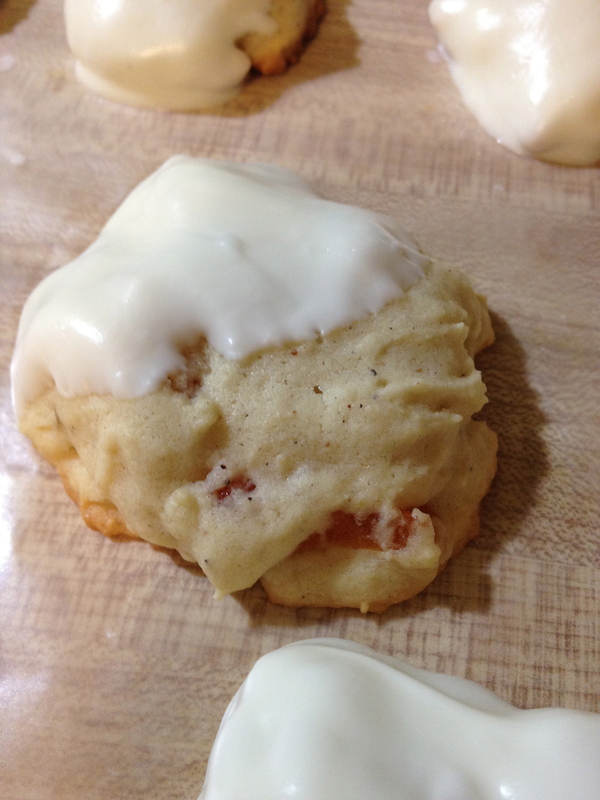 Then I remember I made cookies last year and put them on our blog. They were THE softest cookies I’d ever made. So I looked up the recipe on our site and combined it with the Betty Crocker recipe. The Betty Crocker recipe calls for the bag of sugar cookie mix (and I can still fall back on that if this home made dough doesn’t turn out). MIX sour cream and baking soda; set aside. Beat butter and granulated sugar in large bowl with mixer until light and fluffy. Add eggs; mix well. Blend in nutmeg, vanilla and sour cream mixture. Gradually add flour, beating well after each addition. Refrigerate 30 min. HEAT oven to 350ºF. Drop tablespoonfuls of dough, 2 inches apart, onto greased baking sheet. Bake 10 to 12 min. or just until centers are set and edges are lightly browned. Let stand on baking sheets 3 min. ; remove to wire racks. Cool completely. 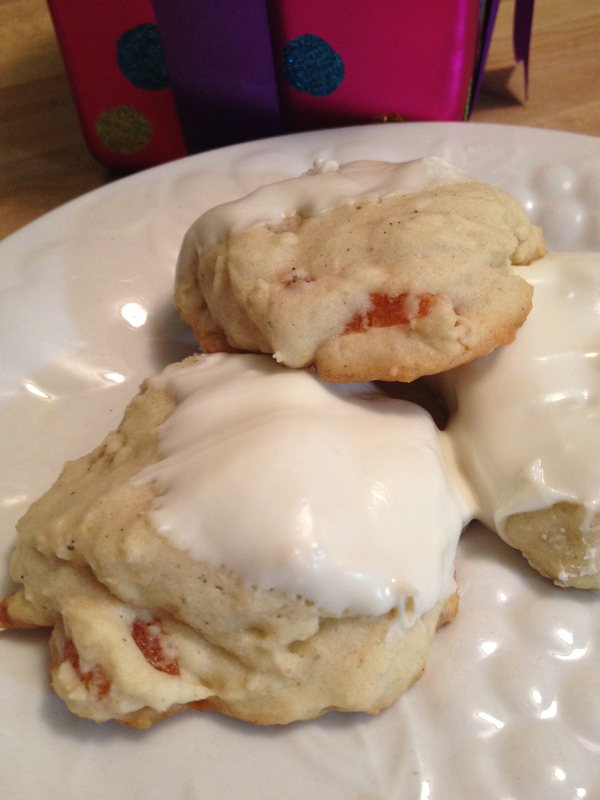 From the Betty Crocker site I added the dried apricots and used the orange extract and 1 bag of white chocolate chips instead of the chocolate. The nutmeg in this cookie mix just pops in your mouth. You can smell it before it’s even in the oven baking. (Wow did that really come from my mouth)! I’ll admit, I tried to substitute All Purpose Flour for Wheat Flour. Why? Because I do not know any better, that’s why. I baked a batch, let them cool, tasted them, and realized that I should not have made that change without first checking with someone who knows what they’re doing. So I just pulled the second batch out of the fridge and have the oven warming to start this over again. Here’s to family fun and tons of baking for this Christmas season! Wishing me luck on my baking adventure! Patricia – Two Girls Cooking.